"Abraham and Isaac," John August Swanson. Used by permission from the artist. Image © by John August Swanson. Artwork held in the Luther Seminary Fine Arts Collection, St. Paul, Minn. 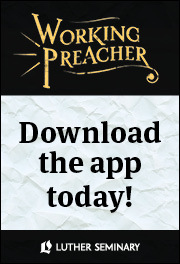 The Working Preacher app provides inspiration, interpretation, and imagination wherever you are, whenever you need it. I have never had a dream that told me to flee in the middle of the night to save my family. Not many people will come to church on December 29th. This reading from Hebrews for the first Sunday after Christmas continues to celebrate the festival of the Incarnation, the adventus/katabasis of God in the human Jesus. Discussion on texts for First Sunday of Christmas (Dec. 29, 2013): (Gospel) Matthew 2:13-23; (1st Reading) Isaiah 63:7-9; Psalm 148; (2nd Reading) Hebrews 2:10-18. Updated weekly with a plethora of information for the working preacher. Find all commentaries on a particular Bible passage using the Bible Commentary Index. Find resources recommended by our knowledgeable staff and connect with others on Facebook and Twitter.